In other words, I don’t go shopping a lot to while away my free time (which is good because there’s not much of that!) or just buy things because everyone else does. 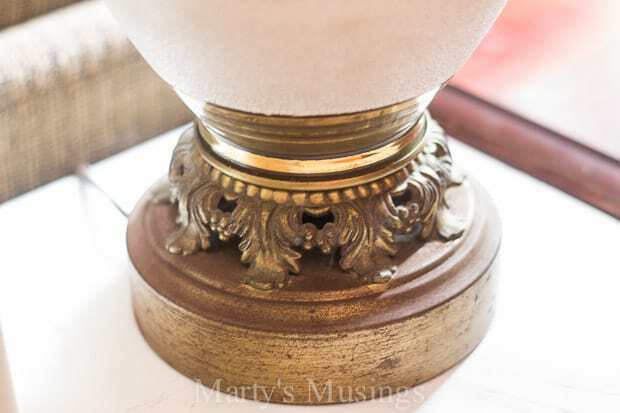 I’m learning to invest in some pieces that will be classic and last for years and incorporate them into rooms with yard sale and thrift store bargains. I’m also realizing that everything doesn’t have to be a DIY project. Truth is I don’t have time to completely DIY my home and even if I wanted to it’s not necessary. I want my DIY projects to bring me joy and not just land on another to do list. When Balsam Hill contacted me about creating a project for spring I was excited to stretch my wings a bit. I had heard of Balsam Hill from all the bloggers who shared their beautiful Christmas trees last year. What you may not know is the company sells more than just Christmas decor. 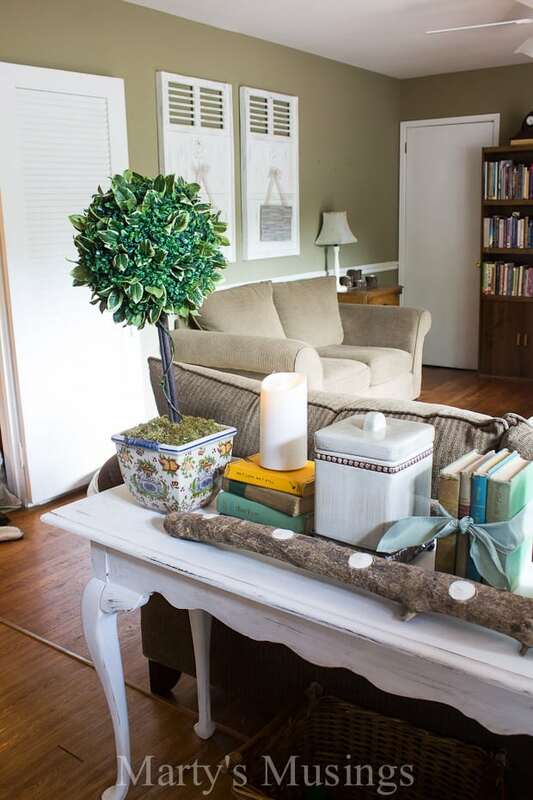 They have an entire category filled with home decor items that can be used throughout the year. 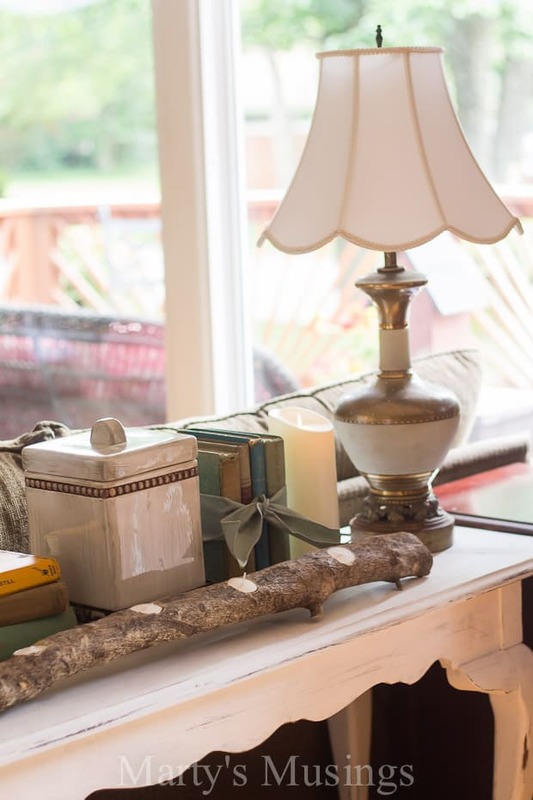 I am not a designer and I admit to a wee bit of envy when I see other homes that look beautifully and effortlessly put together. However, it doesn’t come easy for me. I’m learning what I like and what works, and I thought maybe you’d like to know how someone without design experience creates a home to love. Balsam Hill sponsored this post but all opinions are my own. Pick one item for your core piece. 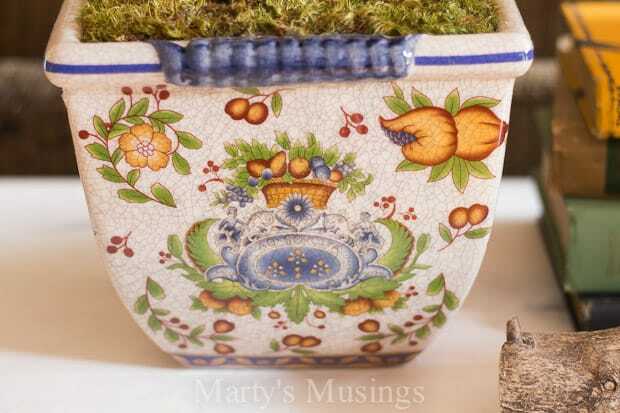 I chose this Boxwood Topiary in Tuscan Planter with inspiration from the warmth and rustic charm of Tuscany. This is a high quality piece that I will be using for years to come. 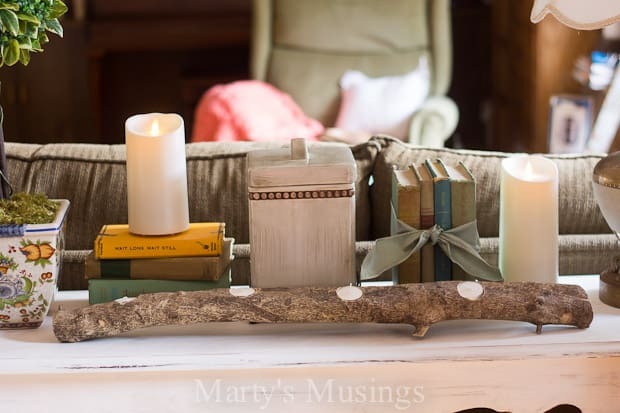 I decided to create a vignette behind my sofa on a chalk painted table found on the side of the road. Yes, I combined high end with a new to me “treasure” and I love it! 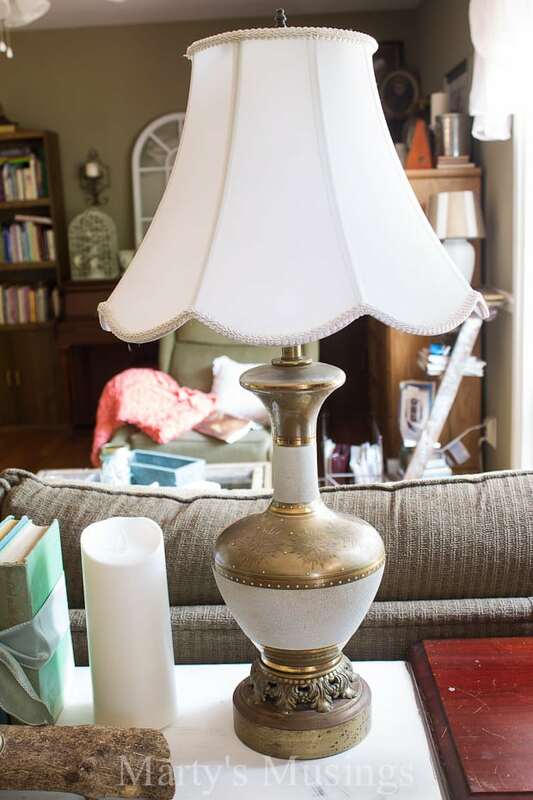 This vintage lamp was passed down to me from my parents and I never could figure out where to use it until I started mixing and matching vintage, rustic and shabby chic accessories. 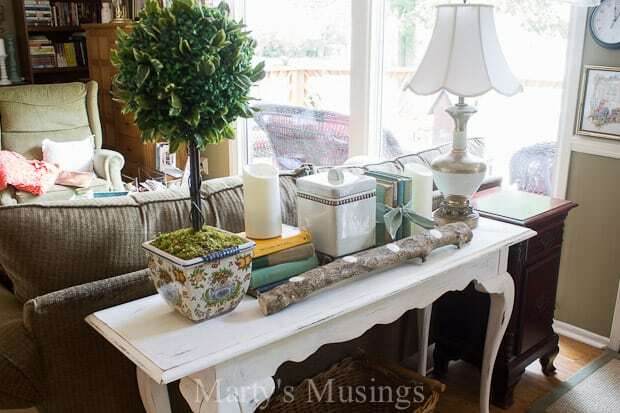 It’s perfect at the opposite end of the table to balance out the topiary and practical for a reading light. 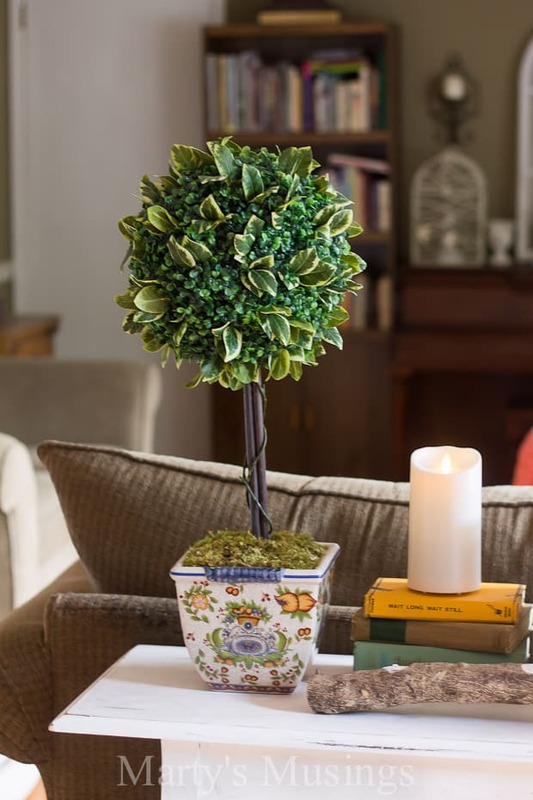 The topiary would also probably be lovely underneath the table on the floor but reality is we have two cats, one dog and one very rambunctious puppy. I told you. Real life decorating here! I love color. You may remember my gorgeous front door, perpetual purple accent wall in my craft room or my bright yellow kitchen (which has since changed again!). Yet the older I get the more I want to add color through the accents rather than just in the paint color. As you can tell, I combined rustic, vintage and yard sale with a brand new classic element. In the past I never would have had the courage to even try something like this but I love the way it turned out. And you know the only one I need to please? That’s right. Me! Here’s a secret I’ve learned from other, more well known bloggers. They take the time to mix and match their accessories and move things around. They don’t always get it right on the first try, and “right” is totally subjective. That means you and I can learn as well! 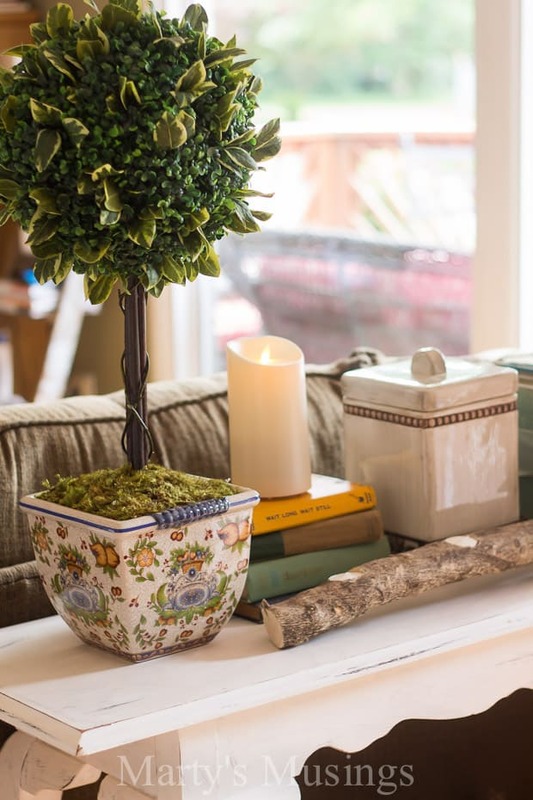 The branch candle centerpiece has been used in many vignettes and tablescapes and the ceramic container is from a yard sale. 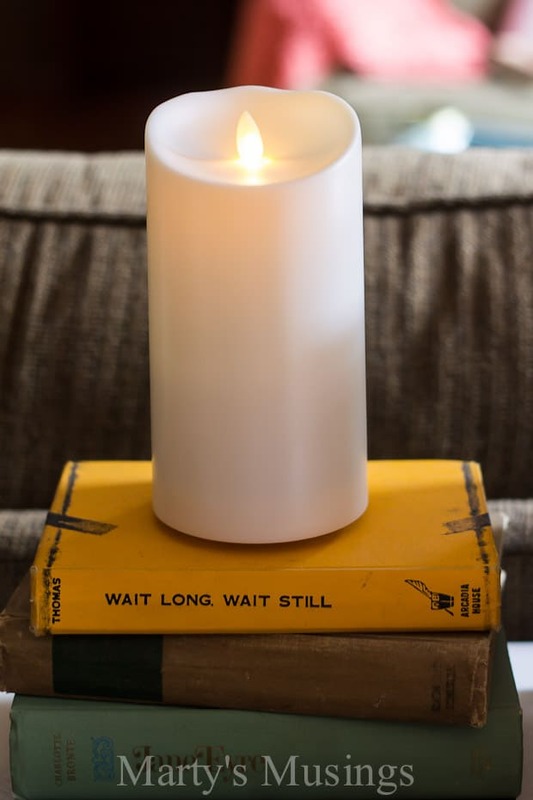 My husband just loves these flameless battery operated candles with remote control (he is a guy, after all!) I chose to use them indoors but they will probably end up outdoors on our front deck at some point. I’m constantly adding or subtracting things from vignettes around the house as my eye realizes something is missing. 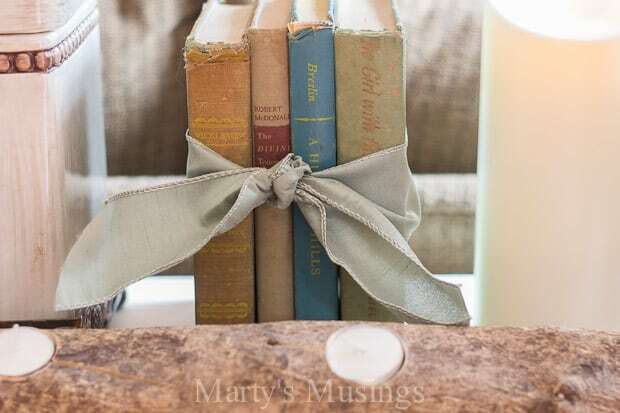 With this one I added this beautiful ribbon in sage from Balsam Hill to some old books we found on the street (yes, it’s amazing what you can find walking around the block!) and it adds a simple touch of elegance. I created a cute 30-second video that I hope you’ll enjoy! Balsam Hill is the kind of company I want to work for. When our most recent family crisis began, they graciously extended my deadline (which was supposed to be Mother’s Day) and sent me the most beautiful orchids. Their concern for me and my family was genuine and they treated me with utmost respect. I am deeply grateful for the opportunity to work with them and write about their beautiful products as well as their amazing kindness. Now go shopping and check out their website! Firstly, I am sorry for your recent loss and hope you are all recovering from it. I’m not religious in any form but do admire people who have belief. From your DIY exploits you’ve created a beautiful home and proven all someone needs is imagination, not necessary a huge a budget. I love anything to with thriftiness, especially revamping something for little as create something unique and personal. Keep the amazing work up. Hi, Sarah. 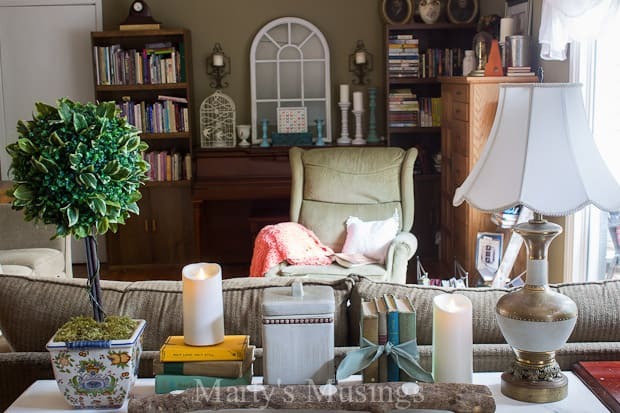 Thanks so much for commenting on my mix and match decor! I do love trying new things and experimenting to see what I really like. Sometimes it works. Sometimes it doesn’t! Thank you for your concern for our family as well. Our faith is definitely holding us up during a hard time. I hope you’ll continue to read and be encouraged as well. Have a great weekend!